Lauryn Arnott with refugee Safari Bahizire and her portait of him. Visual artist Lauryn Arnott’s experiences living in South Africa and Zimbabwe have strongly influenced the artwork in her 2015 SALA exhibitions. Arnott believes that looking to the past can help shed light on the future, and says her work focuses on the journeys and transformations people make when fleeing countries of conflict. “When you don’t have a choice, there’s a lot more anger in it,” she tells InDaily, when asked if her art is cathartic. Arnott was born in Zambia. Her first experience of conflict came after her family moved to South Africa when she was 14 – as a young white girl, she found herself in an unwitting position of privilege. The tables turned when she later moved to Zimbabwe to marry her partner. Forced to flee after being targeted by President Robert Mugabe’s land takeovers, the couple arrived in Australia in 2003. One of Arnott’s most comprehensive collections to date can be seen in Conflict to Refuge, a solo show containing pieces from the 1980s to the present. Encompassing a range of media, including charcoal and collage, it is the Multicultural Communities Council of South Australia’s first SALA exhibition and is showing at its 113 Gilbert Street premises until August 14. “It’s all about migration and transformation, really,” Arnott says. 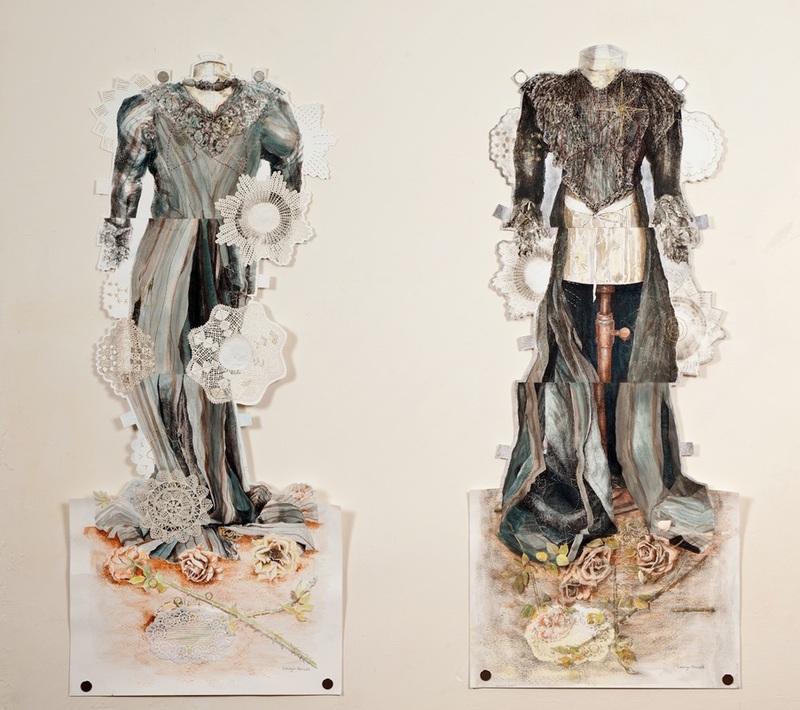 Lauryn Arnott’s Commemorating the Unknown Pioneer Bride 1 and 11 – assemblages – drawing/embroidery, collage, mixed media on paper, 150 x 61cm each. Also on display during SALA will be The Black Wedding Dress, a work combining ink drawing and collage which is showing in the Saint Ignatius College SALA art show from August 7-9. It is inspired by an antique black dress worn by a Hahndorf bride (German Lutheran women traditionally wore black wedding gowns), and reflects another of Arnott’s interests. Arnott says one of her most important works to date, Journey Home – which she has donated for an Australian Refugee Association exhibition at the Port Noarlunga Arts Centre – was made soon after she arrived in this country. 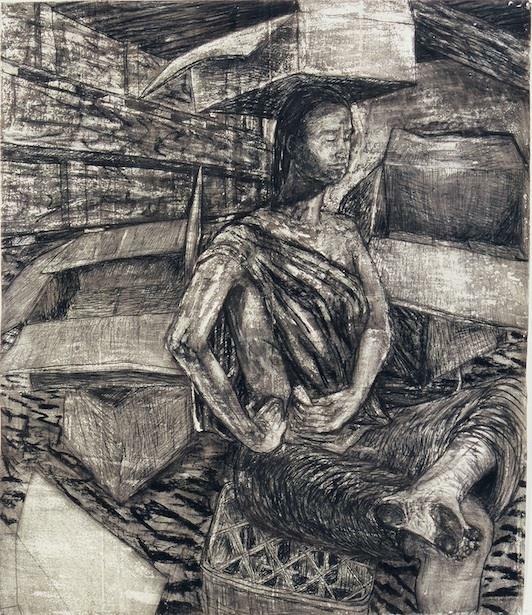 Lauryn Arnott’s Journey Home (seated figure), Charcoal and charcoal pencil on Dessin 300gsm paper. The Australian Refugee Association exhibition, titled To Tell Another’s Story, features work from a number of different artists and intends to promote cultural diversity and human rights. Arnott has also contributed a portrait of refugee Safari Bahizire, who arrived in Australia in 2013 after fleeing the Democratic Republic of Congo when rebels invaded his village. When told that she could paint Safari’s portrait from a photograph, Arnott protested. Whether drawing on her experiences in Zimbabwe, South Africa or here in Australia, she strives to break down boundaries of identity – religious, national or otherwise – in her work. “I think, throughout all the different countries I’ve lived in, it’s always the human element – that is, human dignity – that is the most important aspect and focus of my work. Lauryn Arnott has work on show in five exhibitions during August, including To Tell Another’s Story and Things We Do). Details of the three SALA shows featuring her work can be found here.